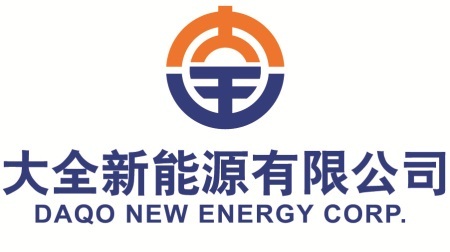 June 30, 2015, CHONGQING, China--Daqo New Energy Corp. (NYSE: DQ) ("Daqo New Energy" or the "Company"), a leading polysilicon manufacturer based in China, today announced that it has commenced pilot production of the newly added 6,000 MT polysilicon capacity at its Xinjiang site. All the construction and installation work related to the Hydrochlorination system as well as the newly added polysilicon capacity has been completed. The Company has already ceased the operation of the original Hydrogenation and switched to the new Hydrochlorination system, which is expected to largely reduce the consumption of electricity. "We are very excited to complete the technology improvement of Hydrochlorination and start pilot production for the new polysilicon capacity. We expect to fully ramp up the capacity to 12,150 MT in August and reduce our production cost to $12/kg in near future," said Dr. Gongda Yao, the Chief Executive Officer of the Company.